PM me for further details. I'll let them go pretty reasonably priced. Thanks for the INPUT fellas, to be honest with you the reason I was going with 2 stroke gassers is because it is what I am good with on tuning and running. I have had a few 4 stroke glow engines, and got them running well, but the low speed idle qualities were just not RELIABLE, and I could not faithfully trust the engine. Not a fan of adding on board glow driver systems etc. I don't want to risk putting engines I don't trust in a B25 that's why I was thinking about 2stroke Gas. And going to a nitro engine is not for me. NOW TO BE HONEST,, I really want 4 strokes in the plane for the sound, and have done a lot of reading about Gas 4 strokes. I planned on buying a couple saito 150s and sending them to CH ignitons to have them converted to gas but have read about a lot of problems, such as bearing failure and the engine just beating itself to death, as well as carb tuning issues being amplified. So I looked at purpose built Gas 4 strokes. I looked at the Saito FG21 but have read of problems, I looked at the NGH series of 4 strokes and read nothing but trouble out of them, The only one I have seen that looks like it would be an option would be the O.S GF30 which is pricey but if reliable would be worth it, but I have not been able to find any real user experience with the engine. Last edited by raron455; 10-10-2017 at 06:29 PM. I found a good deal on 2 Saito 180s black knights, ($400 for the pair) same size as the 150s but a little more power to spin that 3 blade. Once I get them in, I will have them converted to Gas, Put em on my H9 Test corsair and hopefully have no problems, Just got to have the 4 stroke sound on this one. 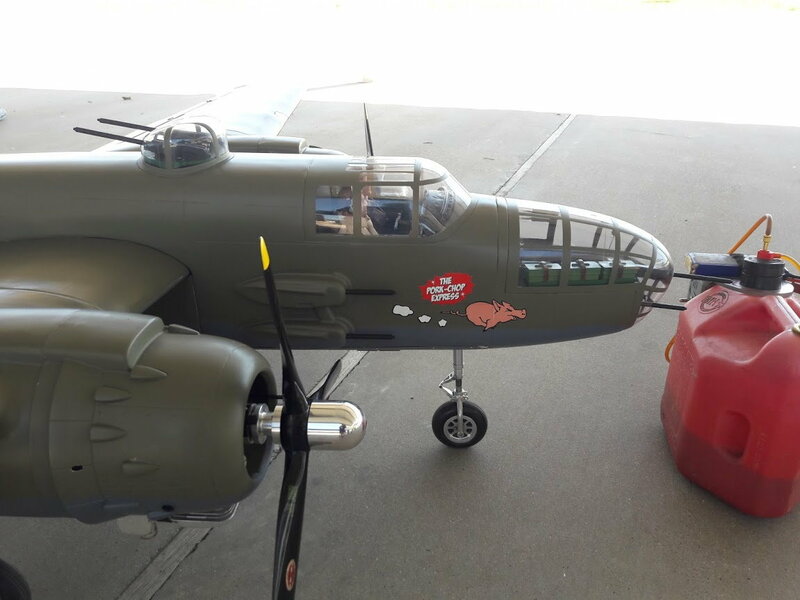 My friend has 180's converted to gas by CH-I, running in his B-25. They are fantastic. Just one data point, but there you have it. We fly formation, mine with the 150 glow setup. Great sound and sights with 4 turning on a low pass! WoW ... Ummm ... Mustfly, transmission not clear, say again. Over. Allright fellas, I have a question, did you guys put this together with the CA hinges it is designed with? I was going to put in robart pin hinges, and then started inspecting, there is no wood blocks for the hinges, just the wood at the back of the wing, which is thin. So it does no good to put hinge pins in that wood. What did you guys do,, I personally am thinking of just putting the CA hinges in as I am not going to be yanking the plane around, but am not sure about long term??? Last edited by raron455; 01-14-2018 at 05:43 PM. I also used CA hinges but I did opt for some "better" ones. The ones in my kit seemed really hard and I was concerned with the CA soaking properly so I just used some Hanger 9 ones I had on hand. But like you said for just doing circuits any CA hinge should be fine. I used the CA hinges on the ailerons. I used flat plastic pin hinges on the flaps and elevator. the aileron hinges held up for about 3 years of use before they started to break. I used CA hinges on mine and like Eldher I used flat pin hinges held in with canopy glue. Been flying mine for 5 years and everything is holding up well. By the way, the video on page 60 of my plane is with 2 DLE 20's with side exhaust which are not quite as powerful as the RA version. The 20's provide plenty of power as you can see in the video. 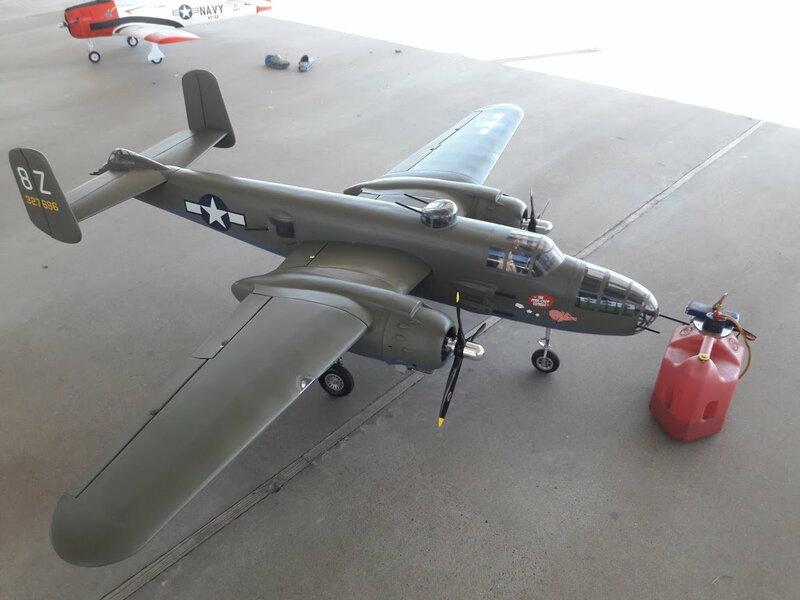 I also chose 2 stroke engines as the B-25 was obnoxiously loud and noisy. I like the sound of the 2 strokes when they are tuned together. To each his own though! Enjoy the build. Last edited by raron455; 06-06-2018 at 01:42 AM. Congrats on sticking with the build and successfully getting her in the air. It's definitely not a quick build project but worth it in the end. Raron455, what CG did you end up feeling happy with? I have one I built a couple years ago which ended up being put on the back burner. It just needs to have its motors installed. I have a pair of saito 150s or two power 160 electric motors. Still torn on which way to go, but I've pulled the plane off it's shelf and moved it to the work table. I just completed my model with 2-20cc rcgf engines. The center section is a bear to carry up the steps 18 pounds. My model came out at 33 pounds, Has anyone flown one at that weight? A fellow club member has one weighing in at 31 lbs. that is flown regularly. You might want to review the last half of this forum to see if anyone was closer to the 33 lbs. mark. Video of mine at 34 lbs 4 ozs. Flys great at that weight. Century Jet retracts with Robart aluminum wheels and brakes. Bomb drop, DLE 20's. Several months ago, I went through the process of converting mine to electric. Had everything weighed out, what power requirements were going to be needed and so on. Using the glow motor engines and what they weighed when it was originally balanced, I had placed almost two pounds of metal weights in the nose. I'm well experienced with running electric setups as most probably know. However, in this case, I had assumed I would need about 3500 watts total....accounting for 100 watts per pound. I had measured the plane's weight without motors, and then added in the electric setup including batteries plus 2 pounds of dead weight. Unfortunately, once everything was in place, motors mounted, esc's, and batteries, the plane wouldn't balance anywhere close...even trying to get 110mm-115mm. I had slung the batteries in the bomb bay and since the battery weight would be split just fore and aft of the cg, I had thought that would be a neutral movement to the balance. In order to get the plane to balance, it would result in a plane that weighs about 38-39 pounds. Well...that's far more then the power output I had calculated. Plus....I do not have brakes installed. I had set up the current power system as a 6s system in order to run two 6s 6000 batteries in parallel PER motor. Total of 4x 6s batteries on board for 12000mah per motor. This was theorized to provide 6-8 mins based on amp draw and watt usage at a 3500 watt combined output. That would have been fine for a 34-36 pound plane, but not 38-39 pounds. I could increase the power output levels by switching motors to a higher cell count...ie going up to 8s, but then the problem is Id have to run 4x batteries total with only 5000-6000mah per motor available (two 4s packs in series and then per motor). That would then only provide a flight time of 3 mins. I do not think that is wise. That would be enough flight time to take off and do one lap and land with no reserve. I could also do a 10s setup(but again the same problem with battery capacity) which still yields 3 min flight time. I know there's several of you thinking.....just slap some gas motors on it and go fly. Well.....I really cant stand the smell of gasoline and honestly Ive had virtually no luck running gas engines anyway. As such...the plane will end up sitting on the shelf. Sad, but no point in trying to fly it only for it to stall and wreck on takeoff on its current power setup. Could it fly on the current power? 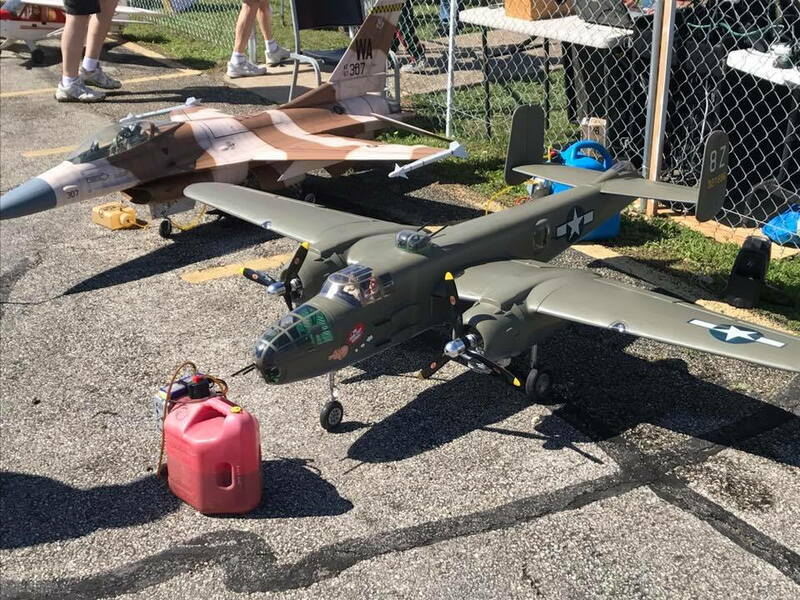 Possibly and I do have a 80" balsa b17 that jumps off the runway quickly on a lot less power then I had anticipated, but, that's also not a $3500 aircraft like this ESM B-25. 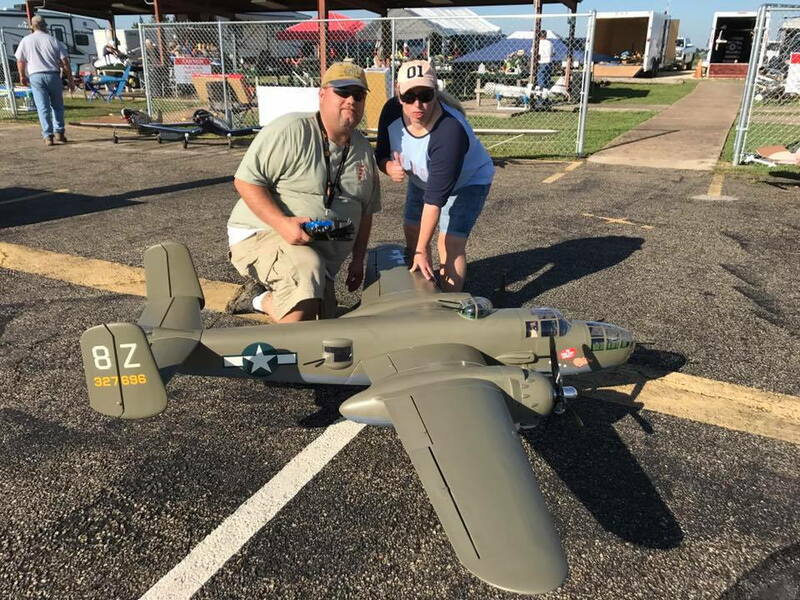 I do have the ESM Me-110 running on the same power setup I installed on this B25 and it flies great even on half throttle and can make the pattern even on one engine(with lots of rudder)...but it also weighs a lot less. Shrugs! Maybe I'll come up with a reengineering idea at some point including potentially taking out the full nose greenhouse with gunner and shoehorning batteries(at least some) in there. Its iffy if two 6s packs could even fit there. When I first built mine I was using SR Batteries 5 cell 3500 mAh NiCd's. I had 4 packs and if I remember correctly I had all 4 packs in the space above the nose wheel. Perhaps you could make the fuselage area right in front of the cockpit windscreen removable and drop 2 - 6 cell batteries into that space. You would need to measure that space to make sure they would fit but that only involves removing the nose gear. It also means you would not have to touch your nose turret as well. Good Luck...hope this works cause this is one fun plane to fly! Howu much did your plane weigh and how much power output were you producing when you had it setup with the 5 cell nicads? The props I have on mine are 2 blade turnigy type E cherry wood 16x10s. Ive found they produce considerably more thrust then MAS 16x10 3 blades for less amp draw ...so maybe there's still some hope. Thank you for the suggestion. I think somewhere up front is the only answer. Figuring out how....well....that'll be the head scratcher. I will still have to carry two out of the four 6s batteries in the forward bomb bay regardless just to have the mAh capacity.